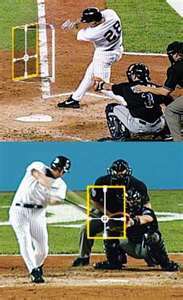 The Strike Zone in Baseball and Recognizing and calling a strike zone is essential to becoming a good umpire. 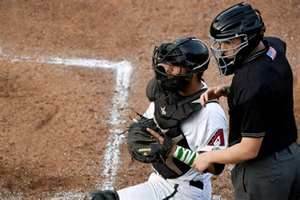 In fact, it’s the number one most important duty a plate umpire performs during the course of a game. 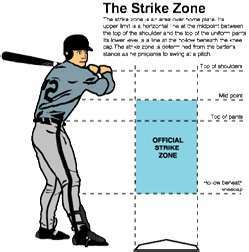 Now that we’ve established the importance of calling balls and strikes, let’s establish what it is. The rule book insinuates it's from across the shoulders to the knees as far as vertical measurements and must cross the plate for the width of the zone. Does that pretty well handle it? Not by a long shot. Shoulders - at the chest, below the arm pits or what? The knees - below the knee, above the knee, across the knee? The width of the plate - only across the white portion or does the black edges count as part of the plate, therefore a strike? Do you know that the zone changes and floats depending on the batter? Whoa….wait a minute….what? Let’s start at the beginning. When the rules for what would constitute a strike was written over 100 years ago, the game was much different. Pitchers concentrated on throwing the baseball past the hitters, and the first curve ball wasn’t thrown until 1867 nearly 50 years after professional baseball teams came into existence. Now bear in mind, early baseball players did not wear baseball gloves of any kind and that included the catcher. I don’t believe a bare handed catcher could have caught a game of Randy Johnson or Nolan Ryan’s 100 mph fastballs. The pitchers did not throw that hard in the beginning, there were no such thing as a breaking ball and strategically pitching to a batter was as foreign as a Star Wars movie. The pitcher had to be given the greatest amount of help possible against the batters, thus a large zone was originated. For all practical purposes, if the ball wasn’t over your head or bouncing in the dirt, you’d better be swinging because it’d be called. Why not rewrite the rule book? Because it’s not worth the hassle. You’d have your purest screaming to leave it alone, the radicals wanting a called strike so small it’d take laser guidance to consistently hit it and then you’d run into the issue of let’s change some other things while we’re at it. So Umpires, I believe properly so, have taken it upon themselves to change the strike zone. In theory it remains as the rule book states, but in reality the strike zone is much smaller up and down and larger by width. So umpires have adjusted the strike zone lower, most of the time below the belt, definitely no higher than the belly button (navel). The logic is sound for this adjustment. If you’re taught to keep the ball low and the ball crosses between the lower chest and belly button (navel), you did not throw the pitch where you hand intended it to go, or if you did it was because you wanted the batter to swing at a ball out of the strike zone. So in reality the strike zone is between the belt and below the knees. This has forced pitchers to throw to a smaller zone and allows hitters a better chance of recognizing a ball or swinging at a strike. A smaller hitting zone to concentrate on in the 1/10th of a second they have to decide. By the same token the width of the strike zone has increased in favor of the pitcher. Again, the logic is sound. You are taught to pitch low and not throw it down the middle of the plate. Therefore more pitches will skirt the inside or outside portion of the plate. The strike zone definitely includes the black edging of the home plate and in many cases, an inch outside. So the standard strike zone, I say standard because no umpire calls the exact same strike zone, is belt high and lower, to just below the knees, and the entire width, including the black of home plate. It’s important to substantiate this zone from the first pitch of the game and maintain it till the last pitch of the game. As long as you’re in the strike area realm and are consistent with it, you’ll never have a problem. Now consider this … the zone of the batter will change as he strides into the ball. Think about it. Let’s use the shoulders for easy demonstration. Your shoulders are set at a certain height as you assume your batting stance, but as you stride forward don’t your shoulders drop? Of course they do. So if you were using the shoulders as the upper limit of a strike zone, you’d have to lower it as the shoulders lowered. Additionally, and this is where a good catcher will get strike calls by framing, is you must call the strike zone as to where the ball crosses the plate. ***as a personal note*** I was playing a minor league game and our pitcher, I fail to remember his name, happened to have greatest knuckleball working that day I’d ever seen. The pitcher, catcher, especially the batter nor the umpire had the slightest idea where the ball would end up. There were 34 put outs that day …27 normal 9 inning outs, plus 7 passed ball strike outs where the batter reached base safely.